3/4 cup (90g) oat flour - make your own by blending plain oats into a fine flour in the food processor. Use gluten-free oats if you're allergic/intolerant to gluten. 1. Preheat your oven to 180°C (160°C fan assisted)/ 350°F. 2. Mix all the dry ingredients (apart from the mint chocolate) in a large bowl. 3. Pour in the wet ingredients and mix well to combine. 4. Fold in the chopped chocolate. 5. Using a tablespoon or an ice cream scoop, shape the dough into balls and press them down onto a baking sheet lined with parchment paper. Make sure you leave space between the cookies (at least 2 inches). The cookies will spread as they bake. 6. Bake for 10-13 minutes. Leave to cool for 10 minutes then transfer them onto a cooling rack and allow them to cool completely. 7. 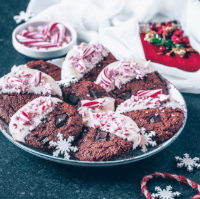 Once the cookies have cooled down completely, dip half way in the melted chocolate (you can use white chocolate or more dark mint chocolate), then sprinkle on top some of the crushed candy cane. 8. Arrange on a chopping board, plate or baking sheet lined with parchment paper (so the chocolate doesn’t stick to the bottom), and allow the chocolate to set. You can place them in the fridge for 30 minutes to speed the process. 9. Store in an air tight container for 3-4 days.